Irish Art - "Irish Rainbow in Paradise" Poster by Irish Artist/Author/Photographer James A. Truett. 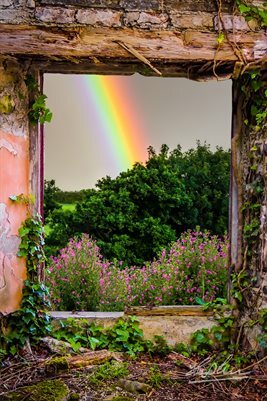 This composite image features a spectacular Irish rainbow with gorgeous Great Willowherb blossoms reaching for the sky, viewed through a window in the ruins of Paradise House, a once stately home built in the 1600s in County Clare and destroyed by fire in 1970. Nature is taking over.